On July 11th at 3 am, the eviction of the Second Technical School Teachers that had been in the city of Tuxtla since July 3rd took place. During the operation, 44 teachers, 34 men and ten women were arrested and according to Manuel de Jesus Mendoza Vazquez, substitute general secretary of Section 7 of the National Union of Workers of Education (SNTE in its Spanish acronym) “State police evicted teachers from secondary technical schools who for a week had held a sit-in in the center of Tuxtla Gutierrez to demand the payment of 150 million pesos to teachers of that level.” The teachers were transferred to the facilities of the Center of Investigation and Restorative Justice Unit of the state capital. On May 4th, state and municipal police detained some 236 young people from the Coordinator of Student Teachers [normalistas] of the State Chiapas (CENECH in its Spanish acronym) who were carrying out a political action in the context of the three-day protest held in Tuxtla Gutierrez by the teachers of Chiapas against the educational reform bill. Videos recorded by witnesses of the operation show that the youths were beaten by the uniformed police. Most of them belong to the State Normal School and the Normal High School, both in Tuxtla Gutierrez. They were charged with vandalism, and although they were released the following day, they are still under investigation for the crimes of damages, robbery with violence and gangs membership, according to the Attorney General’s Office (FGE in its Spanish acronym). The Office of the Prosecutor in charge of these investigations reported that 144 men and 92 women were detained in the moment they looted different vehicles owned by the companies Sonric’s, Lala and Coca-Cola, and that another group of young people were aboard three buses of the OCC and Aury companies, which had been stolen. It indicated that it had ascertained there were products in these vehicles, which were also stolen from an Oxxo store, as well as several Molotov cocktails. On October 12, some 2,000 people, including prisoners’ relatives, members of the Regional Coordinator of Community Authorities – Community Police (CRAC PC), of the State Coordinator of Education Workers in Guerrero (CETEG), Section 18 the Single Union of Public Servants of the State of Guerrero (SUSPEG), as well as relatives of the 43 student teachers arrested and missing since 2014 and students from the Normal Rural School, Ayotzinapa, among others, marched in Chilpancingo in the framework of Columbus Day. The march ended with a rally in front of Government Offices. 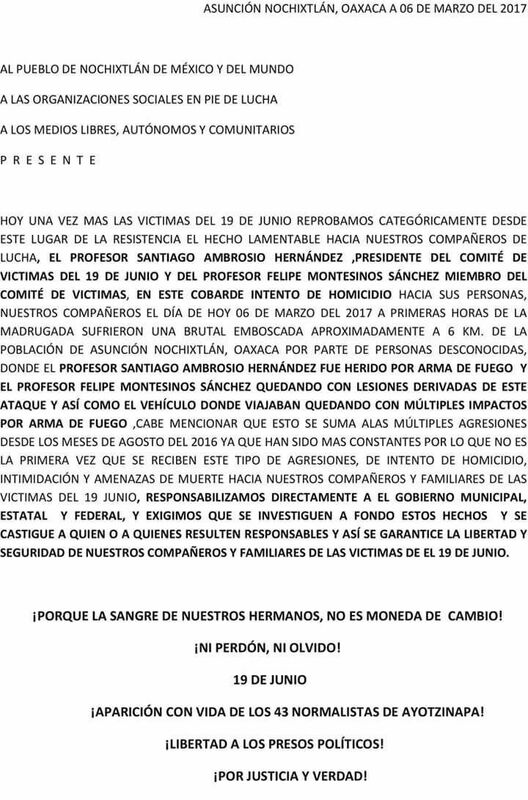 The protesters demanded the release of the Tixtla Community Police promoter, Gonzalo Gonzalez Molina, the community policeman from the Zitlaltepec House of Justice, Samuel Ramirez Galvez, both held in the prison of Chilpancingo; as well as the advisor to the El Paraiso House of Justice, Arturo Herrera Campos, imprisoned in Ayutla de los Libres. They also called for the abrogation of the structural reforms of President Enrique Peña Nieto’s government, especially educational reform, and the presentation of the 43 student teachers from Ayotzinapa. You are currently browsing the archives for the education reform category.